Dr. Yousuf is a board-certified ophthalmologist who specializes in the medical, surgical, and laser treatment of the retina and vitreous. 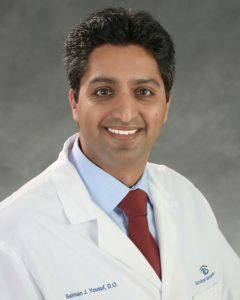 He is fellowship trained in vitreo-retinal surgery. Dr. Yousuf is a graduate of New York University. He went on to complete his medical degree at New York College of Osteopathic Medicine. His internship was completed at Mercy Catholic Medical Centers of Drexel University, and his residency in ophthalmology was completed at Howard University in Washington DC. Subsequently, Dr. Yousuf went on to complete a medical retina fellowship at the Veterans Affairs Medical Center at the University of Central Florida, followed by a two-year surgical retina fellowship at the University of South Florida with Dr. Peter Reed Pavan. He is board-certified by the American Board of Ophthalmology and a member of the American Academy of Ophthalmology, the American Society of Retinal Specialists, and the New York State Ophthalmological Society. Dr. Yousuf’s main areas of interest include macular degeneration, diabetic retinopathy, disorders of the vitreomacular interface, and retinal vein occlusions.